The second-largest province in the country, Styria (Steiermark) is a richly forested region known as the "green heart of Austria." The southern part of Styria is a verdant landscape of rolling hills and vineyards, which the locals often compare to the Tuscany region of Italy. (Though unlike Tuscany, southern Styria's best known wines are light, aromatic whites such as Sauvignon Blanc.) The climate in this southern region is moderate and Mediterranean-like; but other parts of Styria tend toward a harsher alpine climate. The capital of Styria is Graz, the second-largest city of Austria. Graz features one of the most well-preserved medieval town centres in all Austria, with many late-Gothic houses and an utterly charming Schlossberg, or hilltop castle. The historic centre has been designated a World Heritage site. 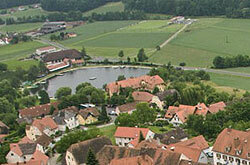 Just bordering the city centre are the key residential districts of St. Leonhard, Geidorf, and Jakomini. Another district, Mariatrost (the neighborhood around Mariatrost Basilica), is considered a prime residential suburb. Graz is an important centre for education. It has three major universities: the University of Graz, the Graz University of Technology, and the University of Music and Dramatic Arts. It is also home to the Graz International Bilingual School, which provides instruction in English and German.